Butterfly Easy Balls are pretty good and I have switched to them. Should have asked about them at the Butterfly booth. They didn't have any on display or for sale. Are they seamless or seamed? Another note. Got an email out of the blue from Minkow - they now have TWO three star balls (a "Premium ball" as well as a regular one), and THREE one star balls. All balls are seamless - the material is listed as "PU" (which I think means "polyurethane") except for one type of (one star) training ball, which is ABS. Weird. Played a little with the iPong seamless three stars this afternoon, they're OK, just sound a little weird (we're still normally playing with DHS celluloid balls). I can't remember if my Kingniks sounded like that, but I'll get them out again tomorrow. Actually, I should try all of the balls I got at the WTTC - just been too lazy to do so. Is it still true that there's only one factory making seamless balls? We recently started using them during our weekend coaching sessions, mixed in with mostly celluloid balls. The first time I put one into play (and occasionally afterwards! ), I thought I had a broken ball, but that's just the sharper sound of the Easy Ball hitting the table. On the table and against the bat, they feel like a really nice, hard ball, and the bounce is high and lively. I like them. Got a bunch of training balls from Minkow last Friday. Didn't get to play over the weekend but I did test them out yesterday. Brand new material - I don't think anyone's tried ABS before. These have a seam, they seem perfectly hard, are quite white. 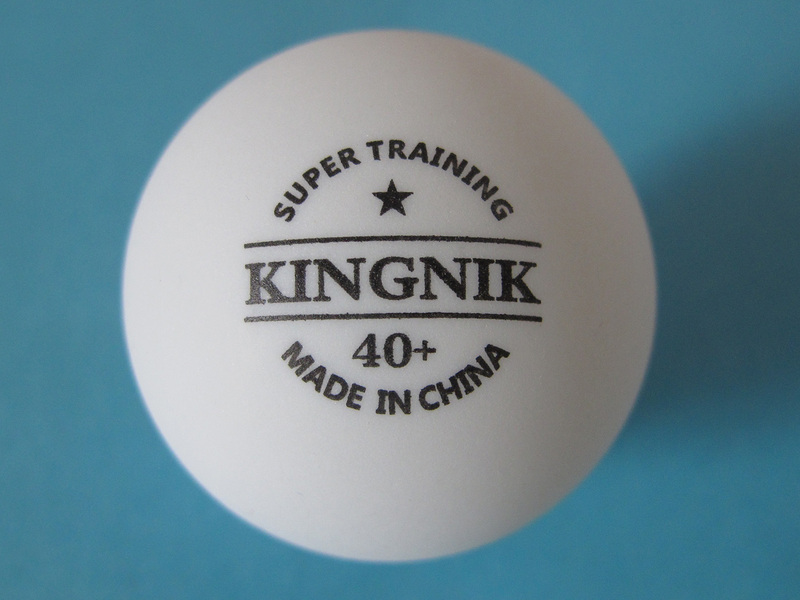 You have to look real hard to tell them apart from the seamless "super training" ball (same markings). Bounce seems the same height, however, hitting around with it, it seems a little slow. I notice serving short is a LOT easier with this ball.. Unfortunately I'm stuck with 500 of the things... don't think any locals will buy them. Might give some away. I'll try them in the robot next, maybe they'll work well in the robot. 2) Their "regular" seamless training ball. The seamless balls are all made out of "PU" (that is probably polyurethane). These seem a little yellow, the sound of the bounce is a little duller than the "super training" (both the seamless and the ABS). Comes in a bag of 144 (the others in bags of 100). Despite the sound, they seem to play like all other seamless balls I've tried. Haven't noticed any un-roundness (some people were saying the XuShaoFa training balls were "eggs". 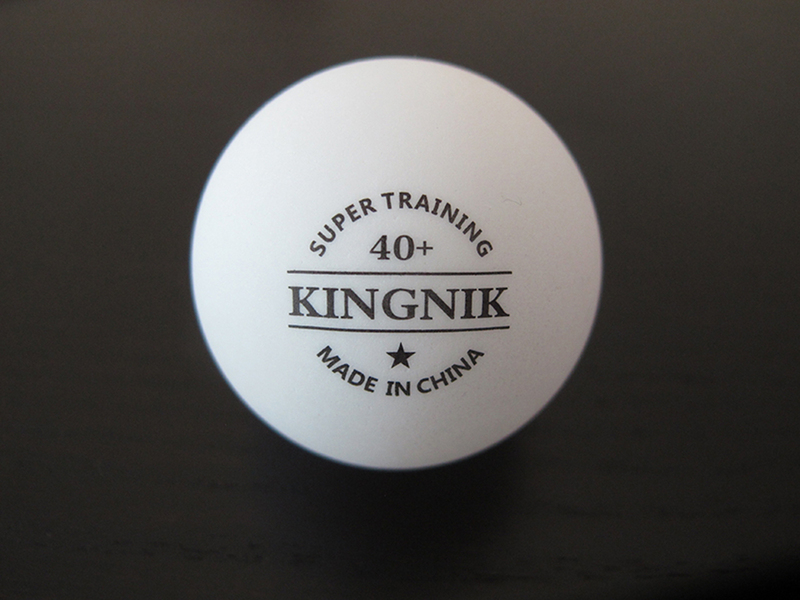 Ironincally one of the people who attends Doubles on weekends doesn't like the high pitched sound seamless balls make - he thought my I-pong balls sounded "broken", but I pointed out that they sounded exactly the same as that XSF ball someone else had brought. Maybe he'd like the sound of these "non-super" balls. These are NICE. Really white, sound just like the 3 star seamless balls. Problem is they're twice the price of the others. I was hoping the ABS balls would turn out nice, I guess they weren't. Why aren't the ABS balls nice balls, Iskandar? The things you mention make it a good ball IMO. It's slow. Or at least it seems to be, for me. I'll probably start offering balls at cost for those who want to try it out.. don't know how expensive shipping would be, though. You could try the Nittaku Japan 40+ 2-star but they actually cost more than 3-star seamless balls. I heard Joola got its new seamless training ball with two big star!!! Wonder whether it will be that good! I'll try when I find some place to buy one. If it's Joola they'll probably be available from all the European dealers. I saw some guys are playing with YASAKA SL training ball...Yasaka also got seamless?? I have recently bought a pack of 1 star 40+ 729, and they appear to be very good value and decent quality for training. Good find, I've ordered some of the 1* and 3* 729 seamless as well, just to satisfy my curiosity about how the major families of poly ball differ from each other. I'm guessing that as 729 seem to be relatively new to the rebadged XSF seamless scene (could be wrong here), their poly balls are more likely to be from the latest XSF generation. hangdog, nice, could you let us know how these 3 stars compare to the 1 stars when you receive them? I'm wondering myself. 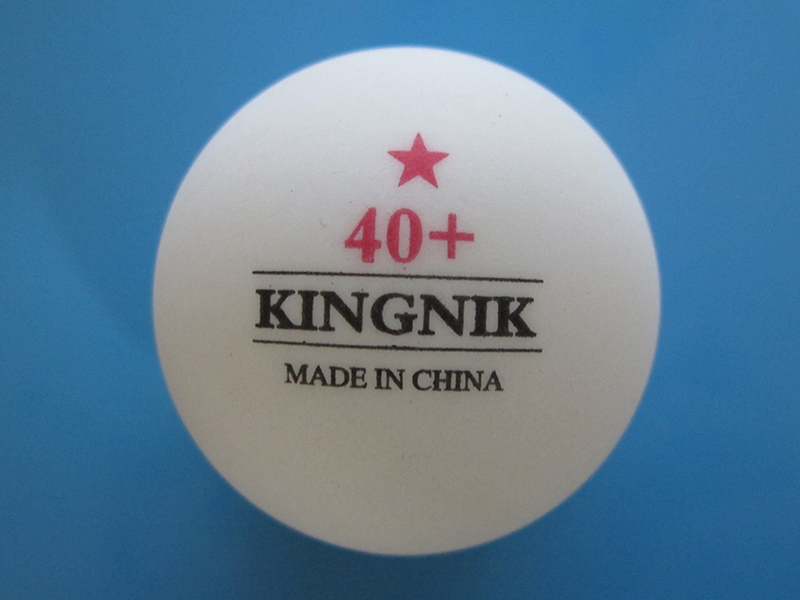 For the 3 star balls, I have bought some Yinhe 40+. I find them to be good quality and value. hangdog, nice, could you let us know how these 3 stars compare to the 1 stars when you receive them? Sure. They're probably still at least 2 weeks away, but I'll post after trying them out.